If you’re looking for a step-up from those binoculars you’ve been using, check out our review of this awesome Bushnell spotting scope. Whether you’re a birdwatcher, hunter or just like observing animals in nature, there’s a good chance you mostly use binoculars for viewing your targets. While they are a great, portable choice, the image quality can be somewhat lacking. If that is how you have been feeling, it may be time to switch things up to a spotting scope. One popular spotting scope is the Bushnell Trophy Xtreme. 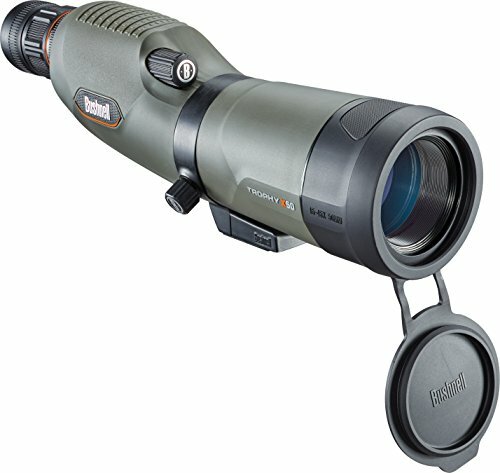 Bushnell has a sterling reputation when it comes to sporting optics, including spotting scopes. However, is this device really that good? Check out our Bushnell trophy scope review below to find out. 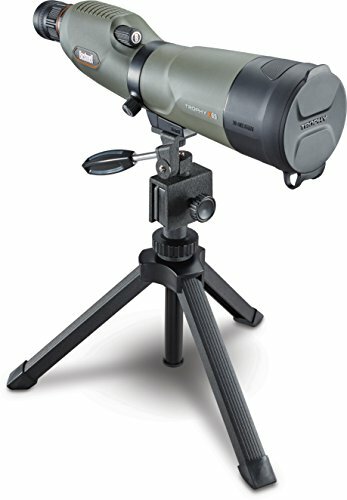 Undoubtedly the first thing you will be interested in with regards this spotting scope is what you get for the price. The great thing about Bushnell is that they’ve ensured that just about every situation is catered for. Out of the box, you get just about everything you need to start spotting with. Apart from that tripod, but more on that later. It features an objective lens measuring 65mm and a straight eyepiece that the company promises provides High-definition image quality. To get a better sense of what is great and not so great about this spotter we are going to look at the main features and components in greater detail. In terms of image quality, the Bushnell Trophy Extreme (or Xtreme as it’s marketed) benefits from a generously wide 65mm objective lens. This provides an adjustable magnitude that ranges from 20x to 60x. Perfect, therefore, for spotting wildlife or if you’re trying to aim your gun when hunting. In terms of quality, the images it produces are of a very high standard. Chromatic aberration, which can often be an issue with spotting scopes, is not something you’d need to worry about with this Bushnell model. Eye relief measures at a comfortable 18.3mm with the Xlt, giving you adequate room to use the eyepiece, even while wearing glasses. 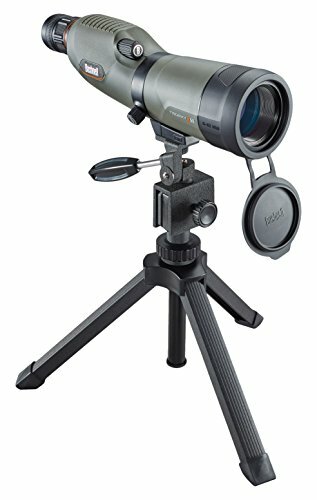 The actual field of view is another great aspect of this scope, with it offering 110-feet at 1,000-yards using 20x magnification and 55-feet at 1,000-yards using the 60x magnification. For the Trophy Xtreme, Bushnell made a wise decision opting for porro prism glass. This BaK-d glass is very high quality, giving amazing refraction and thanks to the phase-correction coatings, phase shift is eliminated. Regardless of the magnification you select, you will benefit from excellent contrast, resolution and color reproduction. A nice touch by Bushnell was ensuring that both the magnification and focus dials are tight enough to avoid accidental adjustments, without compromising on smooth and easy focusing and zooming. Recommended Next: Don’t miss our compilation of the top spotting scope reviews. The combination of fully multi-coated optics with an exceptionally large objective lens gives you a spotter that has awesome light-gathering capabilities. Although it does not have an integrated sunshade as some do, the fact the lens is recessed into the housing compensates that enough. While we’re on the subject, the housing for the Bushnell Trophy scope is a very durable and robust rubber casing. Many people may not appreciate the fact that the smoothing is smooth, this is not designed to be a handheld-style spotting scope. It’s designed to be mounted onto a tripod. That brings us on nicely to what is probably the biggest flaw in this mostly great piece of viewing equipment from Bushnell. The Tripod. Many newcomers to the world of spotting scopes will probably see the fact that it’s sold with a tripod as generally a good thing. Although we are not opposed to scopes that come with practical extras like tripods, it helps if they are practical or built well enough for their intended job. The main problem with the included tripod is that it’s not nearly big enough to make it useful. Add to that the fact that it has a very flimsy design and construction. All in all, in our humble opinion, we’d recommend that you consider investing in a separate tripod. Obviously, whether you’re new to scopes or not, you’ll want to know whether it’s easy to use or not. Generally, the Bushnell Trophy Xlt is easy enough to use, with the magnification and focus wheel conveniently incorporated into the eyepiece. Even in gloves, as they are knurled, they are easy to adjust. Another downside is the straight eyepiece, which is something that a lot of people look for, but not always as convenient if you are birdwatching. As noted already, the Bushnell Trophy Xtreme Spotting Scope has been encased in a robust and hardwearing rubber-armor-style housing. The glass comes with Bushnell’s ‘Bulletproof Guarantee’, meaning that if there are any errors or issues, you’ll be refunded 100% with no quibbles or questions. The scope benefits from being both fog proof and waterproof and the lens is sealed with an O-ring and an optics chamber that’s been nitrogen-purged. The inclusion of both a hard-of both a hard and soft case means that you will always be able to keep your scope in good condition. There are cheaper models on the market, but if you’re looking for a cost-effective spotting scope that will perform well in a variety of lighting conditions, the Bushnell Trophy scope is a great choice. Not only does it have an excellent magnification range, but it follows through and produces crystal-clear and ultra-bright images every time. Whether you are looking to spot wildlife and take pictures or mark them off your book or are interested in taking your best shot at those elusive deer, you’ll do no wrong with this awesome piece of kit. Sure, the tripod is a bit lacking, but you don’t have to use it. For beginners, it might be a great way to ease yourself into using a scope. Bushnell has a great reputation for constructing responsive, high-performance optics and this is clear in the Bushnell Trophy Xtreme.